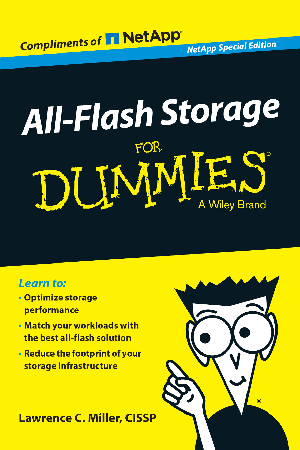 All-Flash Storage for Dummies, NetApp Special Edition, explores the expanding role of all-flash storage in the enterprise. Originally used to accelerate performance for dedicated, mission-critical applications, all-flash arrays are now replacing disk and hybrid-flash systems as the preferred storage systems for virtualized environments. At the same time, scale-out solutions have emerged that are designed to power the new cloud services of the future. The book examines various elements of all-flash storage: how it evolved, and why you should now consider it for all of your primary applications. You get acquainted with the NetApp portfolio of all-flash storage solutions and learn how each is designed to meet the needs of a specific type of application environment. You’ll also learn five strategies for making smart decisions about all-flash arrays for your next storage project. In that classic Dummies style, you’ll walk away with useful tips on how to select and deploy all-flash systems based on your own application requirements.